Yoga has a language all of its own. When you're in class, following a video, or browsing a yoga website, you're likely to hear some or all of these terms. There's more than one type of yoga, so you'll likely hear some of the following terms. This type of yoga is a form of partner yoga that combines yoga with acrobatics. Antigravity yoga is also sometimes called aerial yoga. It involves yoga poses performed on aerial equipment. Ashtanga yoga is a strenuous, sweaty form of Hatha yoga that combines poses with breathing. Bikram yoga, also known as hot yoga, is yoga performed in a hot room to help purge toxins. It's sweaty yoga at its best. Hatha yoga is the foundation for other physical yoga practices. It refers to the performance of physical yoga postures. Hot yoga practitioners focus on performing poses in a heated room to assist in removing toxins. See also Birkam yoga. Created by B.K.S. Iyengar, Iyengar yoga uses props to support positions in order to avoid injury. Kundalini is both a type of energy and a type of yoga. Kundalini yoga is a mystical yoga practice designed to stimulate kundalini energy, which is coiled mystical energy all humans can access. Exactly as it sounds, partner yoga involves performing poses with a partner. Power yoga focuses on strength and stamina, and the poses are meant to generate strength and heat. Vinyasa yoga is a type of yoga where the flow from one pose to another is emphasized. Yoga branches are different from types. Yoga types typically involve the physical activity while branches focus on the various paths and goals of the practice. Bhakti yoga is a spiritual practice that involves channeling force and energy towards experiencing and expressing Divinity. This is the yoga of knowledge and wisdom. Practitioners seek to have the wisdom to separate reality from illusion. Karma yoga focuses on service to the Divine, and to others. Focus in practice is on serving the greater good instead of individual good. Raja yoga focuses on meditation with the goal of quieting the mind in order to achieve a state of stillness. Yogic practice has eight elements or limbs, each which builds on the others, and you'll frequently hear these terms in yoga class. Asanas are the physical postures in yoga. They are the poses you do in your yoga class to stretch the body and stimulate the flow of energy. This refers to sustained concentration or single focus, such as focusing on the breath or on a movement or posture. You probably know dyana by its western name: meditation. Meditation involves clearing the mind and focusing on self-awareness. Pranayama is yoga breathing - it is working with the breath to stimulate the flow of energy and support presence. Pratyahara refers to withdrawing the senses. This occurs naturally when focused in the moment, as is encouraged in yoga practice. Samadhi refers to the ultimate goal of yoga practices, which is enlightenment. There are too many yoga poses and postures (asanas) to name them all, but a few pop up regularly in most yoga practices. Also known as downward-facing dog, adho mukha svanasana is a pose found in most yoga practices and in many flow sequences. Also known as child's pose, balasana is a resting pose that is often part of a yoga flow sequence. Beginners are encouraged to rest in child's pose when they feel tired or overwhelmed during yoga practice. Mudras are hand gestures, sometimes called hand yoga. Also known as lotus pose, padmasana is the standard legs-crossed, seated pose you often see yogis assume before meditating. Savasana is the pose most often assumed at the end of a yoga session. It is also known as corpse pose and involves lying on your back in anatomical position resting. Also known as mountain pose, tadasana is a standing pose that is common in many yoga flow sequences, such as sun salutation. Vrikasana is a balancing pose also known as tree pose. You'll discover many other terms used in yoga, as well. This term refers to the absence of violence, and it is one of the essential elements of a yogic lifestyle. 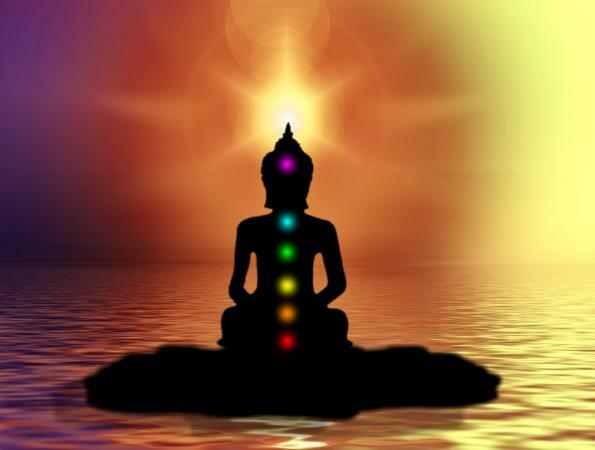 Chakras are energy centers that run through the physical body. Yoga poses are designed to move pranayama, or energy, through the seven chakras. The term for a spiritual teacher. A mantra is a repeated phrase or thought to help focus the mind. Om is one type of a mantra. Namaste is a Sanskrit greeting that acknowledges the Divinity in another. Roughly translated, it means, "The light in me acknowledges the light in you." Om is a mantra used in meditation and sometimes at the beginning and end of a yoga practice. It is believed to be the sound of the universe. You may also see it written as Aum. Prana is life force spiritual energy that flows through all beings. You may also hear it referred to as Chi or Qi, although those terms are more common in martial arts than yoga. Props are tools to help you achieve asanas while avoiding injury. Props may include mats, straps, bolsters, pillows, and blocks. These help alleviate range of motion issues that may limit movement in asanas. Sanskrit is an ancient language, and many yoga terms come from Sanskrit. The Sanskrit word for peace, often chanted as a mantra, such as "Om shanti shanti shanti." You'll often hear yoga teachers refer to your sit bones (or sitz bones), which are essentially the bones in your seat. Ujjayi is a form of pranayama, or yogic breathing. It is also known as the hissing or victory breath, and it is used to build heat. This is an audible form of breath often engaged in during asanas. A male yoga practitioner who walks the yogic path. A female yoga practitioner who walks the yogic path. Sometimes when you're new to yoga, it seems like your instructor is speaking a different language - and she is. Many of yoga's common terms are Sanskrit. However, instructors understand that the terms may be confusing, and most are happy to answer questions you may have about them after class.